If you’re visiting Oahu and looking for a view from above, you may think a helicopter ride, traditional hang glider, or parasail may be your only options. Not true! You have another option that combines the speed of a motor with the exhiliration of a hang glider: the powered hang glider. Powered hang gliders (commonly called trikes) are essentially very light aircraft that are weight-shift controlled, meaning you control the flight path through the sky by shifting the weight of the pod (the part in which you sit). The aircraft are FAA approved and typically carry two passengers (usually an instructor and a student). The aircraft cruise at about 70 mph to 100 mph and have an open cockpit. So, if you’re thinking about participating, keep in mind you’ll have the “wind in your hair” feeling during flight! Paradise Air: Paradise Air prides itself on its safety record, instructor experience, and aircraft quality. The company has a fleet of two AirBorne trikes, but is currently in the process of acquiring a third aircraft and hiring a third instructor (all the company’s aircrafts are purchased directly from the manufacturer). The company has taken more than 12,000 first-timers flying. 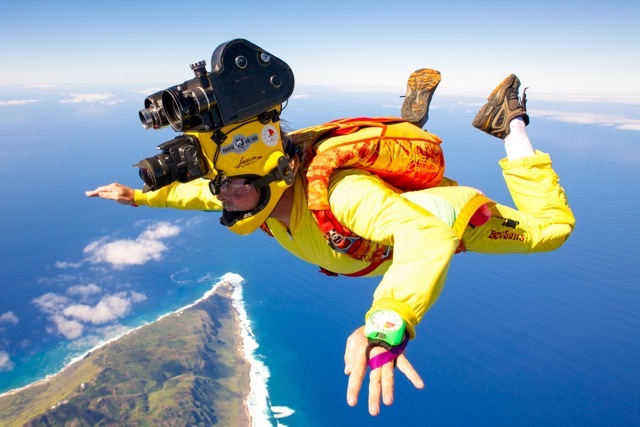 Paradise Air Hawaii, Inc. co-owner Tom Sanders mounts a camera atop his head while filming footage for skydivers. Now a little about the instructors: Tom and Denise are both FAA certified Sport Pilot Flight Instructors. In addition, Denise is an FAA certified Light Sport Repairman for Weight Shift Control and Fixed Wing aircraft making sure the fleet is in tip-top shape, and she’s a private pilot Certified Flight Instructor for Weight Shift (trikes). They are also active skydivers, BASE jumpers and hang glider pilots. Paradise Air is the only company in the state who offers flights in more than one aircraft simultaneously, so you and your guest can take flight lessons at the same time for a shared experience. Paradise Air offers three different introductory flight lessons: 30 minutes, 45 minutes, and 60 minutes. And, you can purchase photos and/or a DVD to take home for bragging rights! Hang Gliding Hawaii: Hang Gliding Hawaii just opened in February of this year and is owned and operated by Oahu-born Eric Nakamoto. Nakamoto is an FAA Certified Private Pilot, with Night Flight Endorsements. He’s also Certified Flight Instructor, Advanced Ground Instructor, Light-Sport Repairman with a Maintenance Rating, and an Independent Rotax Maintenance Technician, too. 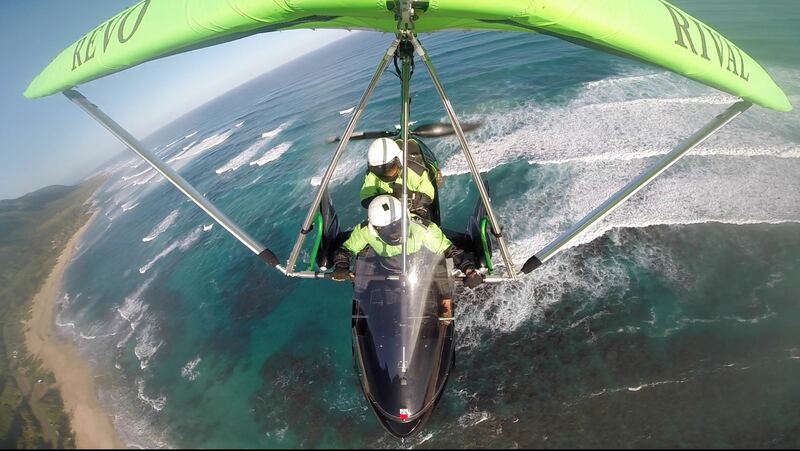 At Hang Gliding Hawaii, flight instructors take clients out for lessons on the company's Evolution Revo Trike. 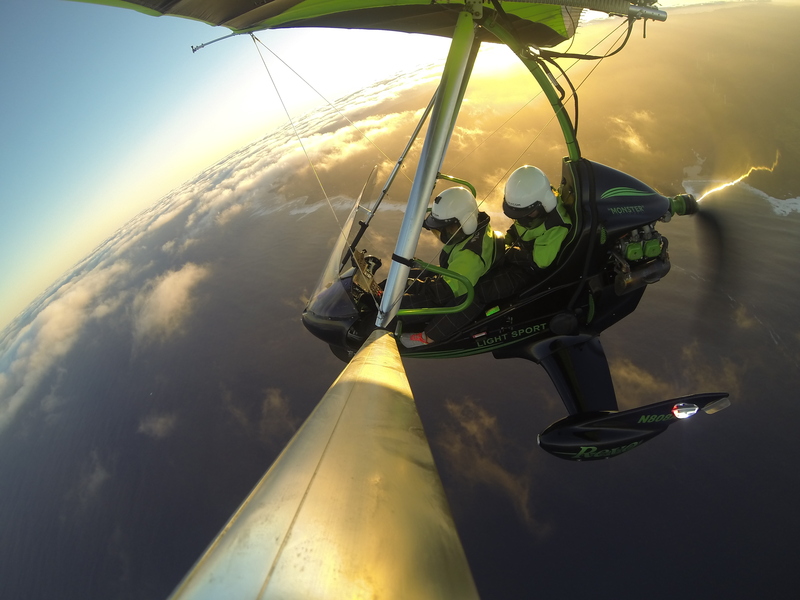 The company operates an Evolution Revo Trike, which Light Sport and Ultralight Flying Magaizine calls the “Ferrari of Flying Motorcycles.” According to Hang Gliding Hawaii, the aircraft is equipped with extra large back seats, more leg room for comfort, night flight capabilities, and award winning construction. According to the company’s website, its aircraft travels at 100+ mph. Nakamoto says his company boasts a perfect safety record, and Hang Gliding Hawaii was selected for the 2015 Best of Waialua Awards in the Flight School Category in July. At Hang Gliding Hawaii, clients take lessons from a flight instructor, who shows them how to operate the trike. Hang Gliding Hawaii also offers 30-minute, 45-minute, and 60-minute introductory flight lessons. Photos and/or DVDs are available for purchase (which Nakamoto says he edits to music). Both companies fly seven days a week starting at sunrise, to maximize the time in smooth air with light winds. And, note that the flights are actual hands-on introductory flight lessons, with the option of getting real piloting time. Per FAA rules, neither company are allowed to offer passengers air tours, like those offered through Hawaii Aloha Travel. Powered hang gliders are a safe and comfortable way to soar above Oahu and enjoy the island’s beautiful North Shore landscape. So, you may want to add “flight lesson” to your Hawaii vacation to-do list!